Taste test: These are small chips that look like normal potato chips but are actually baked, still kind of crunchy but without the greasy taste of a normal potato chip. A light amount of honey and mustard are on the chip, but not enough to make me totally happy. 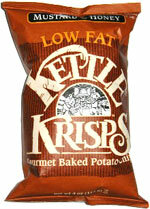 Still, a good alternative if you're looking for a lower-fat snack. 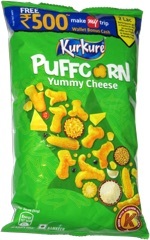 This snack was discovered by Eleni at Network World at Whole Foods Market (formerly Bread & Circus). Review published .